Now that the Galaxy Note7's chance to be this year's best phablet has gone up in flames (sorry, I couldn't resist), LG may have a real shot with the V20. The phone launched a few weeks ago in South Korea, but it still isn't available for purchase here in the US. However, the pricing details for the unlocked model are now out. 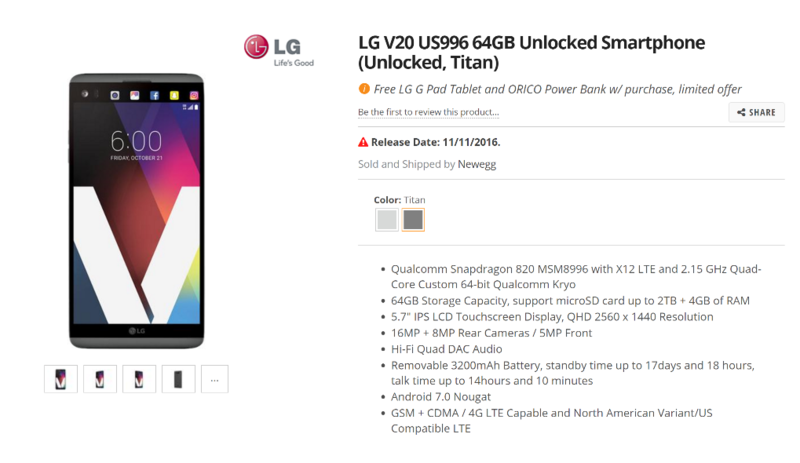 While customers who pre-ordered the V20 from select carriers will get the $150 B&O PLAY H3 in-ear headphones as a launch bonus, those of you who buy from B&H or Newegg will have a $150 LG G Pad 7.0" tablet thrown in instead. Considering this G Pad's 800p screen, 1GB of RAM, and 8GB of internal storage, I think I'd rather have the headphones. The G Pad's specs may be weak, but the V20's certainly aren't. The phone sports a 5.7" 1440p display, a Snapdragon 820, 4GB of RAM, 64GB of internal storage, 16MP and 8MP rear cameras, and a removable 3200mAh battery. It's also got an excellent DAC, and it's (technically) the first phone to ship with Android 7.0 Nougat. If you'd like to pick a V20 up, you can pre-order one from Newegg today or B&H on the 19th for $799. Both retailers are including the G Pad 7.0", but Newegg is also throwing in a battery bank of unknown capacity. We've now learned that unlocked V20s from B&H and Newegg will also receive the $150 B&O PLAY H3 in-ear headphones via LG. When the redemption page goes live on the 28th, you'll be able to request your pair here. Thanks, Brad and Jon.